Thanks to its scope, the Reading Partners program was recognized with an award for honorable mention in the FNLIJ (National Foundation for Books for Children and Youth) contest – The Best Reading Incentive Programs for Children and Young People. 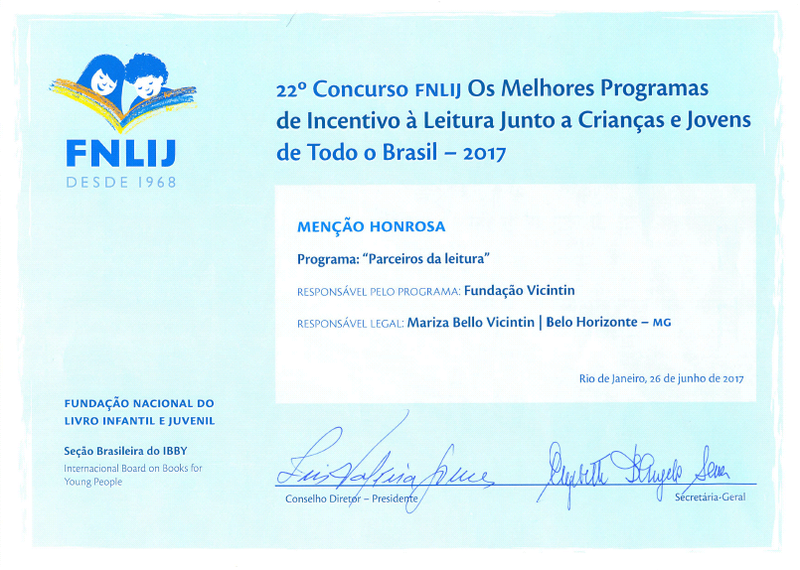 Conceived by the National Foundation for Books for Children and Youth, the contest recognizes the commitment of people and entities engaged in promoting and encouraging the habit of reading. The Vicintin Foundation program is carried out in 43 public schools and philanthropic institutions and offers children and young people a wide range of options in literature as well as pedagogical meetings, creative workshops and playful activities to encourage reading. The initiative already includes dozens of institutions and we intend to expand its actions in 2018. The Vicintin Foundation is a non-profit organization, founded in 1985 with the objective of developing programs, projects and social actions linked to the policy areas of the municipalities in which Rima Industrial S/A operates.